It still needs the outer sashing/border strips. But I think I will try to do something about those two shorter rows in the middle; ease the sashing strip in a bit better perhaps. It felt good to get this far and be able to clean up all my figgy pudding mess for a few days. I still really like this fabric line! Absolutely beautiful. Love the design, colors, prints...and love the little star in the rails. You have done an excellent job. Thanks for sharing. i love these fabrics too. your quilt looks great and the star is fabulous! That's really pretty... especially loving the little star on the bottom! I love this! That figgy pudding line is delicious!! Love it,....especially the star in the corner! Fantastic! 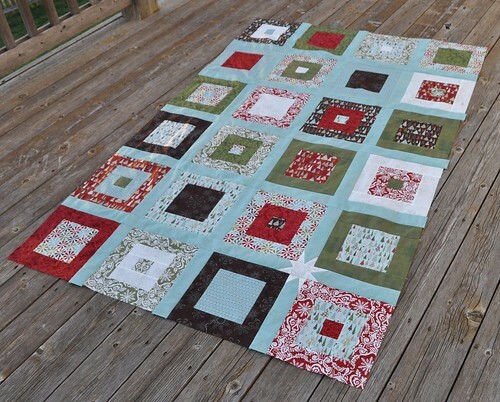 I to love the special single star such a fun feature of your quilt! Very pretty - and I love that little star! Awesome idea. I LOVE it! Love, love, love! Very cute! Love how it just has the one star. Very nice! Love the fabric and the little star! Ooh! I love that little star in the sashing corner! Very cool, Vicki! The star is a fantastic addition! Two of my favorite things, Basic Grey & Moda, all in one quilt. Love this! I love the whole thing! My favorite is the star in the sashing - great touch! !